What do we have to do to get an invite to Prince's "New Girl" viewing parties? It turns out the music legend is a major fan of Fox's "New Girl" - so much so that he's gotten himself a guest spot on the show. In the comedy's February 2 Super Bowl episode, "Party Time," Zooey Deschanel's Jess and Hannah Simone's Cece get invited to a mansion party thrown by Prince, who'll be playing himself. The role is something of a dream come true. "New Girl" executive producer Brett Baer told E! News that The Purple One contacted the show last season "because he's a huge fan ... He's a Nick and Jess 'shipper!" Baer said. "He knows everything about the show. He contacted Zooey and Hannah directly and asked to do the show. We couldn't work it out last year. But when the Super Bowl thing was floated, it was perfect timing." But Prince didn't want just a cameo. 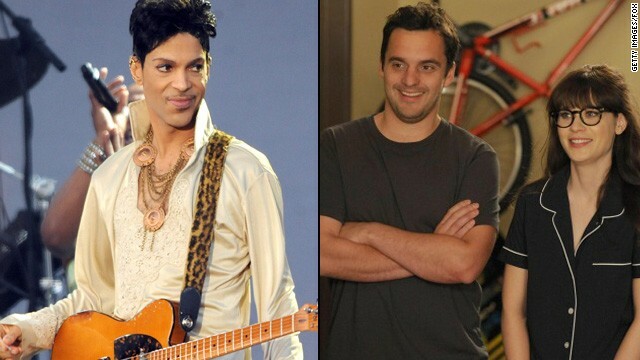 According to another "New Girl" exec, Dave Finkel, Prince told them he wanted "'to be involved in the show in a real way and I want to help Nick (Jake Johnson) and Jess with their relationship.'" It sounds like he'll get a chance to do exactly that (because, really, who would deny Prince? ), since in the "Party Time" episode Nick, Schmidt (Max Greenfield), Winston (Lamorne Morris) and Coach (Damon Wayans, Jr.) try to crash the fun. Do they make guitars small enough for that guy to use? What's with all the Prince hate? He's one of those great popular musicians who put classic album after classic album in the 1980's and continued to make some excellent music in the 90's. His newer music isn't as good, but most artists don't make strong music after their prime years. To say nobody knows what Prince has done in the last 15 years is just silly considering the success of Musicology in 2004 and 3121 in 2006. Besides, who cares about what he made in the last 15 years when he gave the greatest Super Bowl half-time show of all-time! Name one piece of prince-music from the last 15 years that anyone can remember. I can't name any Prince, Led Zeppelin, Rolling Stones, Bob Dylan, The Who, David Bowie, Pink Floyd, Neil Young, Elton John, Eric Clapton, Paul McCartney, Tom Petty. U2, Bruce Springsteen, Aerosmith, Led Zeppelin, Fleetwood Mac, The Kinks, Rush or Pearl Jam songs from in the past 15 years anyone might know. I wonder if any artist with a current hit will have any hits 15 years from now; or even have the career of any of the bands I named. I pleasure myself to Zooey Deschanel on a daily basis....true story. In related news, the Pope wants to appear on The Big Bang Theory. But not just a cameo. He wants a roll in the sack with Penny. He asked to be on the show? He must not be very busy these days. Prince is what being immeasurably cool is all about.